It is not hard to surmise who owns Werewolf Records, when the label hails from “Carelian battleground”, calls itself Luciferian metal temple and professes to release only black metal and related congruent noise. Carelian and Werewolf alone should have given it away. Werewolf Records are owned by Mr. Werwolf, aka Lauri Penttila, himself, and (my understanding) the label calls the city of Lappeenranta home. Located only 30 miles north of the border with Russia, when I was a kid I had a chance to visit that area twice, and I still remember quiet beauty of Karelian (I actually think this spelling is more correct) forests and majesty of numerous lakes. In cooperation with Hells Headbangers Werewolf Records presented Stella Polaris by Goatmoon at the beginning of 2017. Apparently it is OK by Werewolf Records standards to showcase Finnish black metal not only of its rawest variety. The music can be accessible, like it is on Stella Polaris, as long as it remains Finnish black metal in spirit. I am not familiar with Goatmoon’s earlier albums, but the band is said to have undergone transformation from punk oriented origins to something profoundly epic. 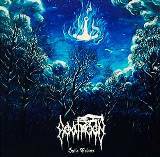 Goatmoon is the creation of one BlackGoat Gravedesecrator (Jaakko Lahde), but on Stella Polaris this visionary engages a full lineup and delves further into the realms both folk and ice-frozen epic. At times it is almost difficult to call Stella Polaris strictly black metal. Songs straggle and blur many lines touching on extreme metal of multiple varieties. Sure, there are melodic whipping Sargeist and Satanic Warmaster riffs with guitars pushed to the forefront (title track), there is a skuzzy and short black thrash Wolf Night, ominous towering and blasting Overlord, as well as rough riding moments of Warrior and Conqueror. Yet barking voice of BlackGoat Gravedesecrator does not overly offend, there are multiple acoustic interludes and flute melody inserts, there is rustic Haive in instrumental Sonderkommando Nord, fluid folk next to the throbbing bass, heroic melody on Warrior, do-it-yourself feel of Black Messiah on Conqueror and even a tragic synth note next to the preceding thrash in that same song. In Stella Polaris Goatmoon even went for some steady rocking rhythms, lighter Immortal of their latter days or I, but tremolo broke out and betrayed the band’s origin on Kansojen Havittaja. Although the natives are mesmerized in Goatmoon version circa 2017, they are still marching on. My version of the album not being the 12” vinyl with 9 tracks on it, I only had a pleasure to consume less than half hour of Stella Polaris. That was enough to say the album lives up to the billing and is enthralling listen from start to finish. Turns out that even narration are cool (title track), when presented with the aura of grim authenticity. Take that Rhapsody of Fire.